As the costs of maintaining a quality breeding program continue to rise, leasing breeding animals has become a viable alternative to the substantial investment of outright ownership. Leasing enables a person to use an income-producing horse without tying up the capital necessary to purchase the animal. In additional to capital management, lessor and lessee are able to share tax advantages. ​The ability of the lessee to spread lease payments over an extended period of time while the animal is producing income (in terms of foal sales or stud services) helps to improve cash flow of the business operation. Lease payments may be totally deductible by the lessee when paid while at the same time the lessor may take depreciation deductions. Additionally, in these days of tight dollars and rising interest rates, a lease is not an on-the-balance-sheet expense for the lessee and may not affect availability of other credit lines. The terms of equine leasing vary enormously. There is a great deal of flexibility in structuring leases to accommodate the needs and goals of both lessor and lessee. Let’s look at a number of breeding stock leases that encompass a broad cross section and discuss the relative advantages and disadvantages from both lessor’s and lessee’s perspective. Earnest Enterprise is endeavoring to engage in equine entrepreneurship. He just made a great buy on a 500-acre stud farm. The facilities include cross-fenced pastures, 100 box stalls in various barns, several houses and excellent veterinary facilities including a lab for artificial insemination. Utilization of all of these wonderful facilities calls for horses. What Earnest needs is a world-class stallion standing at his facilities. Such a stallion could generate a good deal of cash flow and ranch traffic, helping Earnest to get his horse operation off the ground. Earnest wants to breed and deal in purebred Arabian horses. A stallion such as the one he seeks would require a very large financial investment.. But, he’s spent the bulk of his cash on ranch acquisition and he needs to retain some reserve for operation. Meanwhile in Pothole, South Dakota, the Harvey Horse breeder family is wondering what to do with Ibn Greatwon, their U.S. and Canadian National Champion halter stallion. The Horsebreeders conduct a small operation and they do not have facilities to stand Ibn Greatwon to the number of mares which might well be booked given the tremendous demand for stud services of top Arabian stallions. Further, Mr. and Mrs. Horsebreeder have another small business which requires most of their time and they have no desire to try to operate a major breeding facility. Obviously, one solution to the problems of both Earnest Enterprise and the Horsebreeders is for Earnest to buy Ibn Greatwon from Harvey and his family. But, Harvey and his family don’t want to sell Ibn Greatwon. And, Earnest actually couldn’t afford to buy Ibn Greatwon anyway since he has stretched his financial capability to purchase the real estate. A lease may be the answer for both parties. Earnest obtains the big-name, traffic-drawing stallion while Horsebreeders retain ownership of Ibn Greatwon without the headaches of standing him. Such a lease can be advantageous to both parties. The income-producing potential of Ibn Greatwon will be maximized due to the size of the “Earnest Enterprise Estates” and its capacity to accommodate visiting mares at a convenient location. Plus, the traffic generated as the public comes to inspect Ibn Greatwon, and as mare owners come to visit their mares, should facilitate sales of horses from Earnest Enterprise Estates. At the same time, the Horsebreeders can probably earn more income with Iban Greatwon by means of the lease than they would if they had stood him at home since their facilities are very limited. They also avoid most of the labor involved in booking, caring for, teasing and breeding mares. STUD FEES – This income will usually be split between the lessor and lessee. The nature of the split, i.e., whether Earnest gets 33% and Horsebreeders get 67% of the stud fees, or 50-50 or 80-20 or whatever depends on the relative bargaining positions and strength of the parties. It should be borne in mind, however, that labor costs of a good breeding operation are high. Sometimes the lessee in compensated for this labor factor by taking a certain fixed amount 0per mare as a “handling fee”. This handling fee should never cover the labor costs of teasing, breeding and record keeping for the breeding operation. It is a good idea to specify a certain part of any stud fee in the breeding contract as a nonrefundable “booking” fee since this portion is intended to cover labor costs and is earned regardless of whether that mare conceives, thus should not be refunded pursuant to a “live foal” or some other guarantee. BREEDING TO LESSEE – Generally both lessor and lessee will want the lessee to have a certain number of breeding rights to the stallion. This is advantageous to both parties. Breedings are additional compensation to Earnest Enterprise, while they do not represent an “out of pocket” expense to the Harvey Horsebreeders. They also give Earnest a good reason to help promote Ibn Greatwon long after the lease has expired so that he can sell the Ibn Greatwon offspring he owns. Two critical issues to be negotiated are (1) how many breedings should Earnest receive; and (2) can Earnest sell any of these breedings rights or must he use them for mares that he either owns or leases? If Earnest can sell his breedings, he then becomes an economic competitor of Horsebreeders. From Earnest’s perspective, he would like to have the flexibility to sell his breeding rights to generate more cash. On the other hand, if Earnest sells breedings to which he is solely entitled, presumably this means one less breeding in which Horsebreeders participate financially. BOARD, FARRIER AND ORDINARY VETERINARY CARE—Usually paid by the lessee. INSURANCE—How much coverage. Who pays and who is entitled to collect in the event of a claim varies widely. Both parties have an economic interest to protect. INSPECTION – No matter how much faith a lessor has in a lessee he is wise to specifically include a clause permitting him to inspect the leased horse at any time. The agreement should provide for termination of the lease in the event of mistreatment. Such a course should only be pursuant to the written advice of a competent equine veterinarian for the protection of both parties. TERMINATION OR DISPUTES – It is wise to provide a mechanism to terminate the lease or otherwise resolve disputes in advance. Arbitration clauses are strongly recommended, since (1) arbitration usually is much quicker and cheaper than litigation; and (2) in arbitration where each party picks an arbitrator, and the two arbitrators together select a third, it is usually possible to have decision makers who know something about horses and the horse business. Stallions may also be leased on a varying of alternative terms for varying purposes. It is always a good idea to reduce the terms of a lease agreement to writing and in fact, if the lease calls for more than one year of possession of the horse, it must be in writing in order to satisfy the requirements of the Statute of Frauds. If it is not in writing it may be unenforceable. Now, lets look at a couple of mare leases. Rhonda Rancher owns a Quarter horse mare name Bar Belle. Although Bar Belle is an excellent mare, Rhonda can’t really afford to pay the board bill let alone a substantial stud fee for a stallion of Bar Belle’s caliber. Rhonda could get a good price for her but she does not want to sell. Therefore Rhonda decides to lease Bar Belle to Cody Cutter to breed her on an “Every-other-foal” basis to his outstanding stallion, Poco Bucks. She figures she’ll be getting the most for her money. Losing a year out of Bar Belle’s life is a small price to pay for a Poco Bucks foal with no out-of-pocket expenses involved. Generally, in an “every-other-foal” lease, the lessee (Cody) takes possession of lessor’s (Rhonda’s) mare and breeds the mare to the stallion of his choice, keeps the resulting foal, rebreeds the mare to either the same stallion, or possibly by agreement to another stallion and returns Bar Belle to Rhonda in foal. Generally the lessee (Cody) pays all of Bar Belle’s expenses during the time she is in his possession. This is probably the most common type of mare lease, frequently an oral agreement rather than a written one. This is a major judgment error on the part of both parties because: (1) such a lease may well be impossible to execute in less than one year thus Statute of Frauds could bar its enforcement; (2) memories fade more quickly than ink, (3) it is more businesslike for leases to be in writing, (4) it is easier to protect both parties with a written lease rather than an oral one, and (5) the difference in perceptions is easier to discover upfront when an agreement is reduced to writing. VETERIANARY FEES – Who pays and how much? Frequently the lessor bears the veterinary costs but they may be divided into regular and extraordinary expenses. Another method of division is by dollar figure, e.g. lease pays all veterinary expenses up to $2,500 and lessor pays thereafter. TRANSPORTATION EXPENSES – Who bears them? Are the foal’s transportation expenses included? WHICH STALLION: -- The agreement should not only identify the stallion to be used but also provide for the event of the chosen stallion’s death, sale or infertility. At times, parties will specify a category rather than a second specific stallion, such as “any other stallion at Cuttin’ Corner” or “any other stallion designated by lessor, provided such stallion’s fee does not exceed $20,000”. WHERE WILL THE MARE BE KEPT? WHAT WILL BE DONE IN THE EVENT OF THE MARE’S DEATH OR INFERTILITY –If the mare dies during the birth of the first foal, can Rhonda substitute a mare? Or own half of the one already born to Bar Belle? What if mare and foal die during the birth of the second foal? Better to answer these questions up front. “What if’s” can cause real difficulties when everyone is emotional over a tragic event. HOW WILL THE MARE BE KEPT?—Pasture? Stall with a run? In a show condition? INSPECTION RIGHTS: As we discussed above in the stallion-lease context, a lease should contain a clause grant inspection rights to the lessor and/or lessor’s veterinary representative. DISPUTE RESOLUTION CLAUSE -- A lease agreement is a contract and every good contract ought to contain clauses concerning resolving disputes that arise under it. These clauses should state where a dispute will be resolved (jurisdiction and venue) and possibly how (arbitration or court). 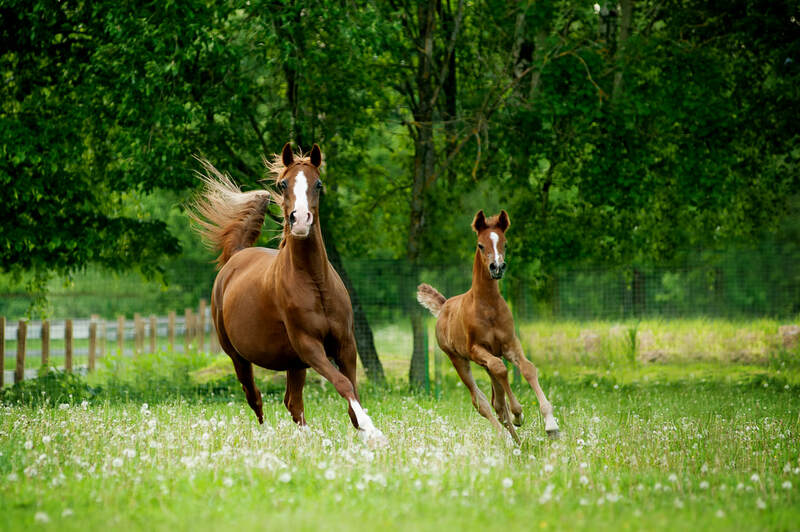 INSURANCE – If no insurance is involved, sometimes title to the first foal is held jointly by the lessor and lessee until the second foal is born. WHO GETS WHICH FOAL? – Generally the lessee would take the first foal and return the mare to the lessor in foal but this is not always the case. The agreement should specify who is entitled to which foal. DEFINITIONS AND GUARANTEES – The agreement should also describe any guarantees or definitions e.g., “Cutter (lessee) shall be entitled to the first foal from Bar Belle. Foal is defined herein as one which stands and nurses unassisted and which lives at least 48 hours.” With this type of definition of “foal”, which really amounts to a guarantee, Cody Cutter wouldn’t get stuck with a “foal” that lives only a few hours. If the agreement further states that Rhonda is entitled to the second such foal, under that definition she is also guaranteed a foal. TIME LIMITS – A lessor will generally want an ultimate limitation on the amount of time that a lessee may have possession. For example, Rhonda Rancher may want a clause in her lease with Cody Cutter that states that if Cody hasn’t returned Bar Belle in foal within 36 months from the start of the lease that she, at her option, can terminate the lease or perhaps substitute another agreed upon mare. A clause like this should specify what happens if Bar Belle is in foal with her first foal at the end of 36 months. Will the foal be owned 50/50 by Cody and Rhonda? Or belong to Rhonda if she pays Poco Buck’s stud fee? Or belong to Cody? Whatever the resolution, it is easier to decide when everyone is still friends at the beginning of a lease than to attempt to work it out when things have “gone wrong” and the parties are at each other’s throats. Similarly, Cody may want an “out” clause if, for example, Bar Belle is barren for two consecutive breeding seasons. He may wish to have the option to simply return her and either have not further obligation or possibly an obligation only to provide stud service to a substitute mare for Rhonda Rancher. While “every other foal” leasing and cash-payment leasing of mares have occurred for years, present-day reasons for the surge of growth in leasing activities are the income tax savings and deferrals can be written off as a current expense, provided that certain legal requirements are met. If lease payments are made with borrowed funds, resulting leverage creates additional tax benefits. For example Fleet Furlong, a graded stakes-winning four-year-old thoroughbred mare recently retired from the track valued at $300,000, is sold to I.M. Sharpe & Co., financiers with offices in New York City, Paris, Lexington, Kentucky and Thermal, California. I.M. Sharpe & Co. offer her for lease for six years at $50,000 per year (which is 1/6 of the purchase price) then after six years of such leasing I.M. Sharpe & Co. as lessor will have recovered the entire cost of Fleet Furlong and regain possession of 10-year-old proven broodmare still capable of producing more foals. From the standpoint of I.M. Sharpe & Co., Fleet Furlong is a great investment. She’s fully insurable for mortality and they will negotiate for the lessee to pay the annual insurance premiums, as well as all board, care and veterinary expenses. I.M. Sharpe & Co. can recover the cost of Fleet Furlong in five years in accordance with the Accelerated Cost Recovery System in 1981 Economic Recovery Tax Act. I.M. Sharpe & Co.’s depreciation deductions will be $45,000 in the first year of purchase (assuming that I.M. Sharpe & Co. has a full tax year), $66,000 in the second year and $63,000 each in years three, four and five. Thus, I.M. Sharpe & Co. will earn their capital outlay back in six years from rental (lease) payments as they fully depreciate the leased asset in five years. The bonus is that Fleet Furlong might well be worth as much or more than her purchase price at the end of the six-year lease depending on her production record. If she turns out to be a good producer and her first or second colt turns out to be a graded stakes winner, as she was, I.M. Sharpe & Co. has won big. They will have a mare, the cost of which including purchase price, upkeep and insurance have been completely paid by lessees. The residual value of the mare is I.M. Sharpe & Co.’s real profit. It could be very substantial, as described above or quite modest if Fleet Furlong doesn’t produce any runners (offspring which actually compete on the track). I.M. Sharpe & Co. can maximize their profit potential percentage if: (1) they buy a mare with a good racing record (or show record in show breeds); and (2) they buy a mare with a good pedigree. Precisely what constitutes a good pedigree is a matter of interpretation buy generally includes stakes winners in the racing world. Now, let’s approach the Fleet Furlong lease from the viewpoint of Igor Investor. Igor knows that in order for him to maximize his profit potential in the cost-intensive and labor-intensive horse industry he must use the finest stock he can afford. He doesn’t have a great deal of money up front but can make substantial lease payments over the next few years. The initial purchase of a mare of the caliber he wants is, at this moment, out of his range since he would have to come up with cash or at the very least 25% down and the balance over two or three years. But, Igor can come up with lease payments for three reasons. First, annual lease payments can be written off as a current expense, rather than capitalized and depreciated as would be the case with a purchase, so Igor will receive the income-sheltering benefits more quickly with a lease than with most purchase subsequent to the first year. Depending on his situation, Igor may be able to make subsequent payments which are partially subsidized in effect as a result of tax savings derived from earlier payments. Second, the lease payments are spread over six years substantially reducing the payments he will have to make. And, third the lease payments won’t show on his balance sheet when he goes to the bank to secure a loan for his operation to make the financial jump to the quality of horses that Igor knows are the most profitable. Paul Husband of Husband Law provides business and litigation services in state and federal courts, including the U.S. Tax Court, as well as tax and business planning for both for-profit and non-profit organizations. He has raised, shown and raced Arabian horses for most of his life, and served for 20 years as an American Horse Shows Association Judge. He has published numerous tax and equine law articles, columns, reports and publications, has been a member of the Board of Advisors to The American Horse Council, is a member of the Graded Stakes Committee of the Arabian Jockey Club and is a Director of the American College of Equine Attorneys.